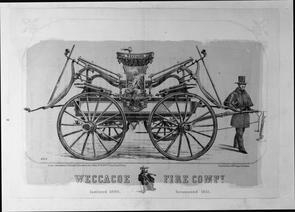 Lithograph by George G. Heiss, 1855, of a fire engine and fire fighter of the Weccacoe Fire Company. Instituted 1800, Incorporated 1833. Printed by Wagner & McGuigan, Philadelphia.